2. Step 1: a very simple, minimal, paint! A recent web browser that supports the <canvas> tag, most do. All the source files you will need are included in this zip archive (4Mbytes). 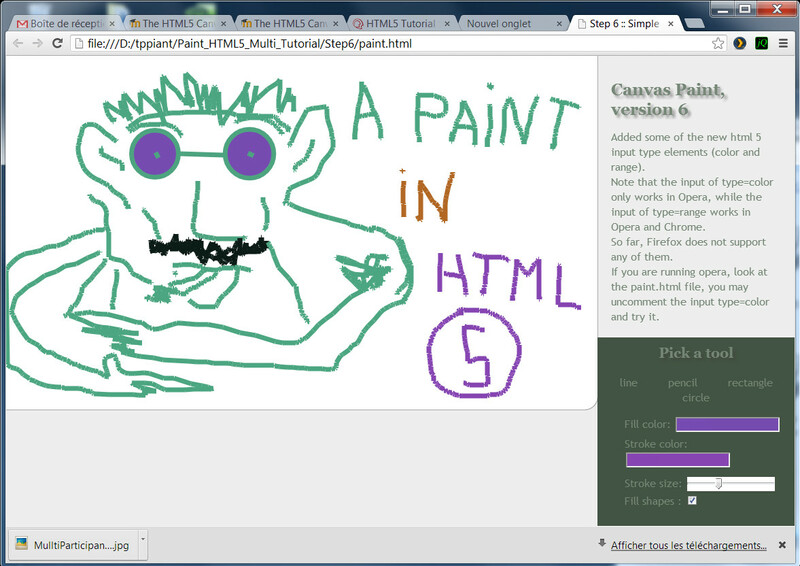 Unzip, go in the "Paint_HTML5_Multi_Tutorial". You will find subdirectories step1, step2, etc. corresponding to each step described in this document. Step 1: a very simple, minimal, paint! The DOCTYPE is the brand new ultra-simple HTML5 DOCTYPE! Notice that if you write ANYTHING before this DOCTYPE line, IE9 will not consider the file as HTML5, and you will no be able to run the example! The <canvas> tag in the page will be ignored. Other browsers will however do nothing nasty if you write some comment at the top of the document. The file paint.js holds most of the code for a small "draw when mouse moves" paint program, while utils.js contains a utility function for getting a correct mouse cursor position, dealing with most of the annoying cases. Notice that in order to draw a line we declare a path, we move to a position, we draw a line to another position, we close the path. The path is drawn at the mainContext.stroke() (line 18) call. It will be drawn with the current mainContext.strokeStyle value, which is defaulted to Black. Be careful: just forget to close the path and at every mouse move you will draw the whole path from the beginning! In fact, mainContext.stroke() draws every draw primitive declared since the context.beginPath() call. If a beginPath() is called while a path is not closed, it is ignored. // Canvas doesn't scale well with '%' in CSS so we use a little trick. Go into the step 2 directory. You may try the example by opening paint.html in your browser. This time we draw only when the mouse moves with a mouse button pressed. We also separated the code that draws from the initialization of the PaintObject. The file drawingtools.js will hold "drawing objects" like pencil, line, rectangle, circle, and so on, while paint.js will just do the job of creating contexts, binding events, etc. Go into the step 3 directory. You may try the example by opening paint.html in your browser. This example shows an interesting use of canvases: they can be layered one on top of another. Using a CSS relative position and the z-index CSS property with different values, they can act as layers in photoshop. By default they are transparent, and if you use the context.clearRect(x, y, width, height) function you will make a transparent rectangle and be able to "see through" it. We will use this feature to draw an elastic line (lines that follow the mouse position) on a transparent front canvas, without modifying the main canvas behind. In order to animate the line when the mouse moves, we clear the front canvas before drawing a line in its new position. Small problem : how can we make the line stay on the drawing when we draw another line ? Go into the step 4 directory. You may try the example by opening paint.html in your browser. This time when we release the mouse button the line is drawn and will stay in the main drawing, even if we draw other elastic lines. Question: how to fix the previous version where lines "did not remain" when we released the mouse button ? 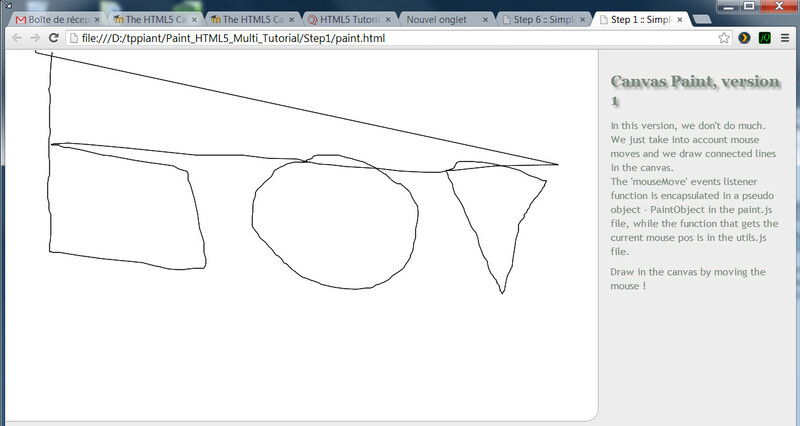 Answer: we just draw the front canvas on the the main canvas on mouseUp events ! Notice that we use a drawImage() call from a canvas context object. Indeed, we can draw a canvas on a canvas! Go into the step 5 directory. You may try the example by opening paint.html in your browser. This time, the same way we did the line tool, we added two new tools: one for drawing elastic rectangles and one for drawing elastic circles. You may look at these tools in drawingtools.js. Go into the step 6 directory. You may try the example by opening paint.html in your browser. <!--  if running opera you may try :<input id="strokeColor" type="color"
We used a <input type="range".../> for selecting the line width. This will work in Opera, Webkit based browser. It is not yet supported by Firefox, but will work nevertheless if you enter a numeric value. For color selection we used a "polyfill", a <input class="color" /> that works with the jscolor.js library. If you are running a browser that supports the HTML5 <input type="color"/> then change the code to display a nice color chooser natively. This way, all the calls to stroke() or fill() using any of the contexts will draw a shape using the selected corresponding color.